Finland continues to demonstrate its position as a technology hub and leader in telecommunications by guaranteeing its citizens the right to broadband internet access. Earlier in the year, legislators had promised 100 Mbps by the end of 2015, but on Wednesday the Ministry of Transportation and Communication announced an intermediate step: 1Mbps by July 2010 for Finland’s more than 5 million citizens. The news, reported via the Finnish broadcasting company YLE, makes Finland the first country in the world to declare broadband internet access a right. Hopefully, the Finnish decision will be part of a larger trend of governments recognizing the importance of a citizen’s access to the internet. An increasingly large portion of the world economy relies upon the internet to function. Not only are retailers selling goods to consumers directly, all levels of business depend on rapid worldwide communication. Socially and politically, the internet represents a chance for a truly open dialogue between citizens. As the rise of the blogosphere and social networking feeds indicate, the internet is also becoming a trusted source for current and reliable information. The free exchange of information is democratizing, and as such guaranteeing access to the internet is a part of protecting democracy. Much of the technology we discuss on Singularity Hub is facilitated by the free and rapid exchange of information on the internet. Broadband connections allow robotic engineers to collaborate, they allow DIY biologists to form a community, and they may serve as the breeding ground for AIs. It’s hard to overstate how the rapid development of new technology depends on our ability to log on, chat, and learn. While France was the first country to confirm internet access as a right, it did not specify broadband speeds, a crucial stipulation given the complexity of content on the world wide web. There are several international groups pushing for countries to recognize the importance of internet access. Among them is the APC European Civil Society Internet Rights Project which features reports on nations measuring their internet accessibility (Finland’s report is fairly praise-heavy). Finland has a relatively long history of supporting its growing tech based economy and citizenry. It is the home of Nokia and regularly invests 3.5% of its GDP into research and development. Back in August, 1998, Finland was the first European country where more than 50% of the population had access to mobile phones. In December of that same year, mobile phones began to outnumber traditional landlines. Fins are prodigious consumers of the internet. According to Statistics Finland (a government run bureau), 83% of people were regularly online in spring 2008 (that’s up 4% from the year before), and about two thirds of citizens were daily users. That’s a big difference from just 8 years prior when only 12.1% of the population had internet access. Obviously, Finland is taking to the internet quickly, likely due to the technology focused economy, and location of many of its inhabitants in remote areas. 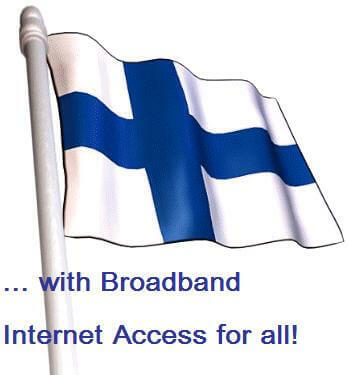 That remoteness will limit the Finnish guarantee, as the government has declared that some 2000 households are too remote to be included in universal broadband access. Still, legislators have promised that besides these few exceptions, no household will be further than 2 km from a 100 Mbps internet connection by the end of 2015.